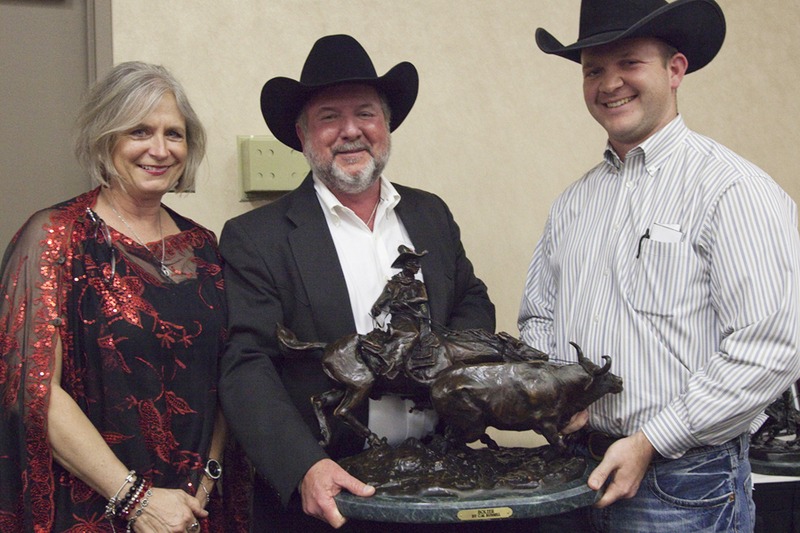 Brangus Breeders Association - Breeder of the Year. Mike and Lisa Doguet, of Doguet’s Diamond D Ranch, started their journey in the cattle business in 1984 with 14 Simbrah heifers and a bull on 225 acres of owned land. By 1992, they were finding it difficult to sell Simbrah bulls, and began looking for a breed of cattle whose bulls could be sold to the commercial cattlemen as easy as the heifers. They really were not too concerned with the show ring. They just wanted to build a herd that could survive in a wide range of conditions from the tough South Texas country to the wetter Gulf Coast region - a breed that could handle the flies and mosquitoes those areas have grown accustomed to seeing. They found all of these assets with the Brangus breed. They dispersed their entire Simbrah herd and bought their first Brangus cows at the 3G Ranch dispersal. They continued to build their herd over the years by buying the right kind of cattle – a moderate framed, easy-doing type of cattle that could thrive off of grass, mineral and very little supplement. In 2004, they were able to purchase 29 donors from the South Gate Ranch herd to complete the foundation herd for Doguet’s Diamond D Ranch. This foundation herd is built around the 804, 200, 38, 88, 820, 193 and 1019 cow family bloodlines. Also in 2004, Doguet’s Diamond D Ranch welcomed Timmy Lucherk to the management team with the title of Genetics Manager. By 2006, Mike & Lisa had 100% confidence in Timmy’s abilities and his vast knowledge of the Brangus breed. At that time, most of the breeding decisions were handed over to him. In the 2004 Doguet’s Diamond D Ranch Annual Production Sale, part interest in a calf named “DDD Lights Out” was sold to the Johnston Family and Thomas Show Cattle which went on to be DDD’s first big show winner as the 2006 International Grand Champion Bull in the Houston Livestock Show. In 2008, a bull named “Doguet’s Hercules” won International Grand Champion and “DDD Toughman” won Reserve International Champion, both of which made a huge impact on the DDD program. This would be the first time in the Brangus breed that one ranch won both honors. For a ranch not concerned with the show ring, DDD was seeing some major success that continues today. The DDD operation now encompasses approximately 5,000 acres of owned and leased land in Jefferson, Atascosa and Wilson counties including a 700 acre turf grass operation. We are proud to be Texan. The Doguet’s Diamond D Ranch management team includes Regan Elmore in Poteet; Matt Willey in Nome, near the headquarters in Beaumont; Mary Douglass, who keeps the records straight; and of course, Timmy Lucherk who oversees all of the activities.